Who is your favourite ref, skater, NSO? Changes all the time. I’ve learned so many different things, from so many different people, it’s impossible to pick a favourite ref. I have many many ref crushes! Who are your favourite team? Team Zebra… We are Legion! 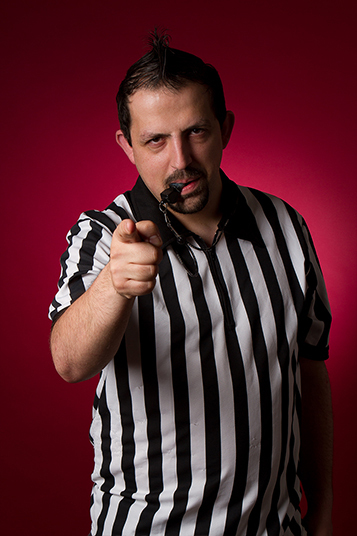 What would be your ideal bout to ref (which teams and where)? London Rollergirls London Brawling vs Gotham Girls Roller Derby @ Champs… Oh yes! It will happen! What is your derby dream? To get WFTDA certification, and be the best official I can be! What other sports have you taken part in? What’s your proudest derby moment so far? Every time I watch my Baby Zeebs reffing! Do you have any other hobbies besides roller derby? Omniscience… Surely that goes for all referees, right?